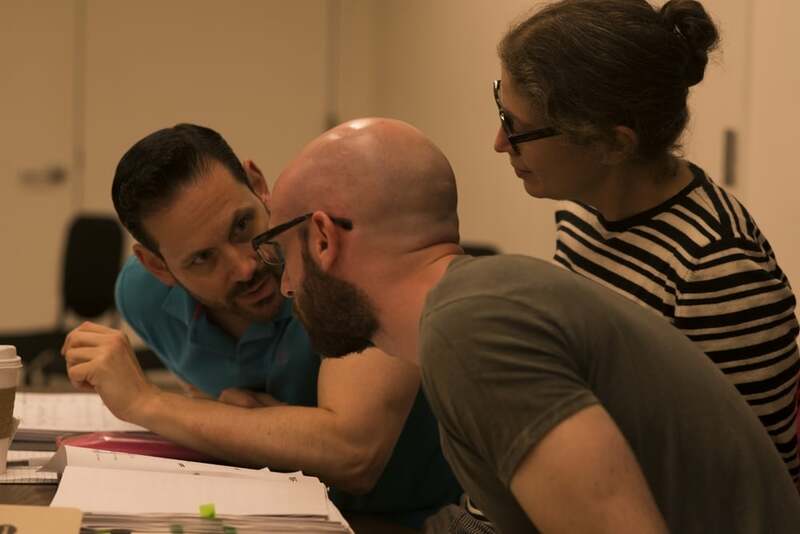 ALT's Founder Lawrence Edelson with composer Jeremy Howard Beck and librettist Stephanie Fleischmann during the 2013 workshop of The Long Walk. American Lyric Theater (ALT) was founded by Lawrence Edelson in 2005 to build a new body of operatic repertoire for new audiences by nurturing composers and librettists, developing sustainable artistic collaborations, and contributing new works to the national canon. ALT is not an opera company by any traditional definition. Many opera companies commission and perform new works; but ALT is the only company in the United States that offers extensive, full time mentorship for emerging operatic writers. While the traditional company model focuses on producing a season, ALT's programs focus on serving the needs of artists, developing new works, and collaborating with producing companies to help usher those works into the repertoire. Prominent alumni of ALT’s Composer Librettist Development Program (CLDP) include composers Christopher Cerrone, Aleksandra Vrebalov, and Jeremy Howard Beck; and librettists Royce Vavrek and Stephanie Fleischmann. Operas developed through the CLDP, and by CLDP alumni, have been presented by a wide variety of companies, including Tulsa Opera, Opera Saratoga, Fort Worth Opera, Urban Arias, Fargo Moorhead Opera, San Francisco Conservatory, New York City Opera VOX, and Beth Morrison Projects; and alumni of the CLDP have been commissioned by opera companies across the country, including Washington National Opera, Chicago Lyric Opera, Houston Grand Opera, Opera Philadelphia, and The Metropolitan Opera. In 2012, ALT was the first company dedicated to artist mentorship rather than operatic production to be recognized by OPERA America as a Professional Company Member – a testament to ALT’s service to the field.